There is a totally different level of pride, perhaps the best kind, that I feel when I call myself Bhutanese. It is a beautiful feeling one gets when one thinks about the best thing in life. It makes us feel most fortunate. Hence, it will not be easy for anyone and certainly not for a 16-year-old living away from home to try and put such strong emotions in words. I could actually even write an epic about how grateful I am to be born in a paradise like Bhutan, and it still might not suffice. This is anything but pretentious! Growing up in a place where I could go outside every morning, spread my arms wide open and breathe the fresh air is a gift in itself. Such is the joy of being a Bhutanese; one is merely thankful to the Triple Gem for every little thing in life, from being able to wake up in the morning to a brand new day to having a plate of rice and kewa datshi (potato in cheese). Life is simple, content and happy in Bhutan. There is more giving with love and compassion than wanting to acquire and own for selfish reasons. Religion plays a significant role in the everyday life of the Bhutanese. Buddhism teaches us that desire causes suffering. Karma is a powerful belief of the Bhutanese. What goes around comes around. Values as unique as thadamtshig and layjudrey (karmic cause and effects) remind us to be kind, thoughtful and considerate. Everything is connected and everyone is dependent on one another- nobody escapes the cycle of life. People believe in numerous dogmas, some even beyond superstition that I find difficult to comply with, but the common faith of humanity that binds the community together at the end of the day is what matters the most. 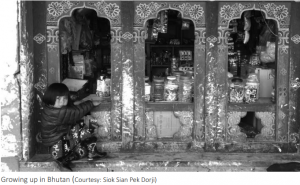 Bhutan is a country where spirituality is strongly bonded with its culture and tradition. Tshechu (religious festival) is a sacred event organised on the 10th day of the Bhutanese month in different districts of the country where people dressed in their best ghos and kiras come together to witness the mask dances that grant them lifelong blessings. There are countless sacred monasteries blessed by great saints on all peaks and corners of the country, and trekking up the mountains to pay homage to the gods is usual for the Bhutanese. At the end, the wonderful sight of the heavenly valleys from the temples on the mountaintops presents the feeling of accomplished bliss as if all our sins have been cleansed right away. Selfawareness is a common aspect of being a Bhutanese. Living in a country where everybody knows everybody else like we are a one big family (which I believe we are) is something rare and truly Bhutanese! Materialism has never claimed priority over family and friends. Happiness is beyond measure when it comes to picnicking with your friends and family between the pristine trees and flowing streams during occasions like Losar and Blessed Rainy Day. The sense of respect and trust is present in the heart of every Bhutanese. There is no other way to success than listening to what our wise elders have to say. Whether it is farming in the villages, attending neighbourhood events in the towns, or the nation’s call for help, the Bhutanese people have always united as one to be there for one another. To the world at large today, Bhutan is widely called the ‘Land of Happiness’ as our country pursues the development philosophy of Gross National Happiness or GNH, which is more important than Gross Domestic Product. His Majesty the Fourth Druk Gyalpo Jigme Singye Wangchuck introduced the concept of GNH as a unique approach to development and the quality of life in Bhutan. Hence, all our values are based on the Bhutanese outlook on life – simplicity at its best. Above all, living under the rules of our generous and benevolent Kings, and being inspired every single moment is the greatest pride of being a Bhutanese. Having someone to look up to and striving to be a better human being each day is nothing less than a miracle, which again is the national identity of being a Bhutanese. Our Kings and leaders have always placed the needs of the people before everything and have done everything to enable the citizens to lead a happy life. Free education, free healthcare, rich environment, rich cultural values and ethics, and happiness as the ultimate goal are a few givens that we only need to be thankful for being Bhutanese. His Majesty has hopes in the Bhutanese to lead the country to a better path and has entrusted the future of the nation in the hands of the youth. Therefore, as a Bhutanese youth, I am responsible to uphold the cultural and social values of the country: taking care and respecting others, making peace, knowing my responsibilities as an individual and a citizen, preserving the culture and protecting the environment. To be a Bhutanese, for me, is to be a true GNH citizen, irrespective of where I am. About Author: Lilly Yangchen is a Class 11 student of Prem Tinsulanonda International School in Thailand.